Alan Carlin, (no relation to George, I’m quite sure) was a Fox News flash in the denialist pan a few years ago. An economist with no climate credentials, but apparently with right wing conspiracist leanings, claimed to have authored a “report” on climate change, that was censored by the EPA. Remember? Anyway, he’s being recycled. Which is normal in the science denial business. And, well, it got me thinking, why not recycle my takedown of Mr. Carlin from several years ago, above. CNBC sought someone to write about “global warming being a hoax” in order to counter a major new report that shows the economic cost of failing to take climate action. Hi there. Given this new report on the cost of climate change, wanted to extend an invitation to Alan Carlin to write an op-ed for CNBC.com. Can be on the new report or just his general thoughts on global warming being a hoax. As Media Matters has documented, the majority of CNBC’s climate change coverage in 2013 falsely suggested that climate change is not occurring or that it is not mostly man-made, even though 97 percent of climate scientists say it is. CNBC is an elite 1% fraud to trap the gullible and unwary? CNBC promotes all kinds of crackpot theories that get widespread coverage and acceptance in the general public. The biggest have to do with the stock market. One of the biggest (that seems to parallel the climate change denial) is that over the long term the stock market always goes up. Well, it does if you ignore inflation. My favorite technique is to use gold as the measure of value. Starting in 1897 when the Dow Jones industrial Ave was first used, the Dow was the equivalent of 2 ounces of gold. By 1982 it was less than that for a near century gain of zero. And we’re ignoring the issue of “survivor bias”. Since the late 1990s when the Dow first approached it’s previous high to now the Dow has gained very little in the ensuing decades, even though it’s now approaching to records. If you can employ “funny math” for investments, it simply follows that you’ll employ funny math for climate change as well. Love that “I’m your puppet” ending of that video. 🙂 I don’t understand why these puppets can sleep at night spreading all this nonsense and regurgitating it like some parrot. I meant “That is all”. S’alright, s’how sum folks tork eh? ‘Speshly if ee be scottish aye. Also just looked that proverb up – LOL. Yep. Yes, and apart from the subjects of this article similar could apply to Christopher Booker for his latest in the Telegraph. I know that it was cited here earlier this week but I figure its worth the comparison, James Delingpole can join in too. 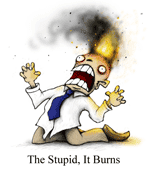 As for Cindy Perman emailing DesMogBlog I would link to that ‘The Stupid, It Burns’ Cartoon had it not had a good airing already this week. You would link that cartoon? Really? I think you just did. If you actually read the article, you will see that CNBC was simply looking for a person to represent the climate deniers point of view, not report it as science fact. DesMogBlog may be an anti-science, climate change denying nut house but CNBC isn’t. In fact, there are many on the right wing fringe which will tell you with a straight face that NBC (and its affiliates) is nothing but a liberal bastion disguised as a legitimate news agency. We should look then, for “opposing viewpoints”, whenever there is a piece about moon landings, vaccinations, or the earth being round. “CNBC was simply looking for a person to represent the climate deniers point of view” For heavens sake: Why? It’s been 120 years, and 60 since broad Scientific recognition of this problem. In all that time, have deniers ever put together a convincing alternate explanation for what is going on? Or even a refutation of the Scientific point of view that holds together? Granted, CNBC should report the news, but that’s the factual news. You don’t ask an astronomer to report on a newly discovered Planet and, for balance, put on an Astrologer. It’s a disservice to your viewers. Did you get this backwards? “DeSmogBlog may be an anti-science, climate change denying nut house but CNBC isn’t”. Isn’t it the other way around? And how does an invitation to write about climate change being a hoax in any way equate with “simply representing” a legitimate “point of view”? Have you actually thought about what you said here before sending it out? « For a Quick 10K – Prove Climate Change is Not Real!